If you drink coffee, you likely are accustomed to tossing out your used grounds: don't. Start reserving these for a multitude of uses around your home, from cleaning concoctions to lush plants. Furthermore, consider how you are reducing your overall trash and waste, which is an eco-friendly thing to do! Use the grounds in your kitchen when cleaning countertops or appliances. Sprinkle grounds on a damp rag and scrub to remove stubborn stains and spills effectively. Line shallow-dish with plastic wrap and fill with discarded grounds; place in the back of the fridge to get rid of foul odors. Toss after a couple weeks and replace to keep your fridge and foods smelling fresh! If you have ever tried to clean-up the ash around your fireplace and hearth, you know how challenging it can be. Make ash easy to sweep by sprinkling some coffee grounds on the area and easily sweep up the mess without the clouds of ash in the air that often occur. Mix leaves and plant matter with coffee grounds and sprinkle at the base of plants in your garden for a rich, no-cost fertilizer. This is especially good for hydrangeas and roses, providing your plants with nitrogen, potassium, and magnesium. 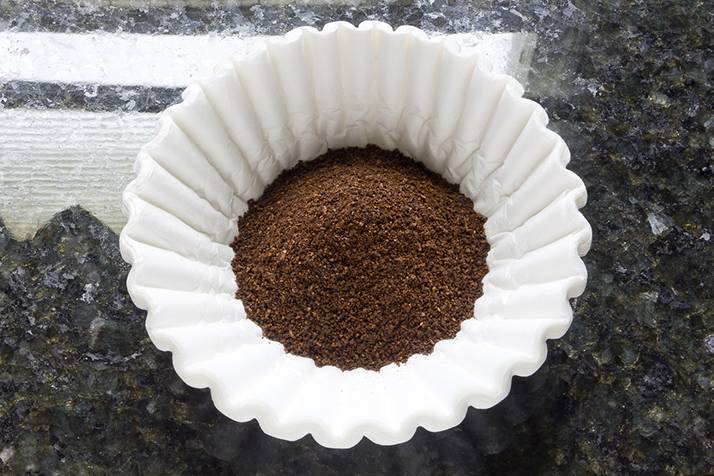 Did you know that coffee grounds are an effective pest repellent? Sprinkle a pinch of grounds at the base of your plants to keep snails, ants, slugs away from your garden. After you have your morning coffee, save the grounds. Consider these five ways to recycle and reuse these, while reducing your carbon footprint on the earth.